Years ago my friend Cecily showed me how to make risotto, she was so enthusiastic about the merits of this dish and was amazed that I’d never made it before! 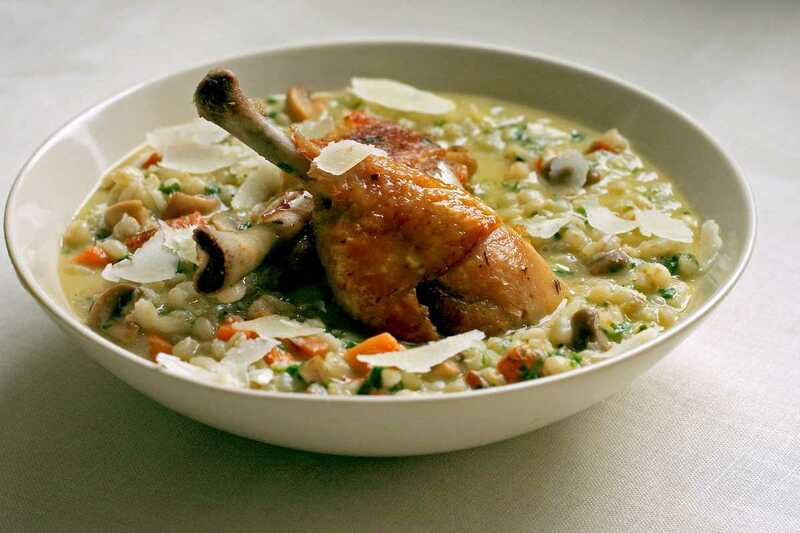 It was the start of a beautiful relationship with this Italian classic; now a staple in my repertoire, I must have made hundreds of risottos, including a few variations…barley is a nice alternative to rice and perfect to serve with chicken. We feed barley to the hens on the farm, so this seems like an apt combination for a dish. A benefit of using barley instead of rice is that it’s considerably more difficult to overcook. Also the grains give a lovely bursting sensation when you chew them which is fantastic. Firstly, I like to caramelise some finely diced pancetta or home-cured bacon to release some vital fat and get an amazing flavour base before adding finely chopped onion to sweat down slowly and gently. I will sweat the onion for a good fifteen minutes before adding anything else, making sure they become soft and sweet. To add some extra flavour and a nice touch of colour, I cooked some carrot dice and some baby button mushrooms in a separate pan to be stirred into the risotto at the very end, along with a generous handful of chopped herbs. Heat the oven to 180C, toss the chicken drumsticks in olive oil and roast for about 30 minutes, until golden and crisp. Cut the pancetta into small dice and fry in a little oil until nicely coloured. Finely chop the onion and add to the pan, turning the heat down. Gently sweat for at least 15minutes until the onions have turned soft and sweet. Finely chop the garlic and add to the pan. Rinse the barley for a few minutes under cold water, then add to the pan. Turn the heat up and stir for a minute, then add the white wine. Stir until the alcohol has boiled off, then turn the heat to medium and add your chicken stock, one ladle at a time, stirring frequently. Cut the carrot into approx. 5mm dice and fry in some vegetable oil a separate pan until slightly caramelised and just cooked. Drain on kitchen paper. Quarter the mushrooms and do the same with them.